“The End: (a Novelette of Haunting Omens & Harrowing Discovery)” by Justine Avery is a riveting short story about life, trust, and lies, not necessarily in that order. Trevor is just your average normal guy – he is happily married with a baby on the way, is a good friend, and spends his weekdays in a cubicle at his 9-5 job. His life is routine and predictable, and Trevor likes it that way; and while he happily devotes his weekdays fulfilling these normal obligations, Trevor most looks forward to the weekends, which he claims as his own time, to spend doing what he likes best: riding his bike. What Trevor is not, is your average normal biker. He is a free-ride mountain biker, uninhibited, unafraid, and unrelenting as he pushes his skills to the extreme in the canyon lands of southern Utah. He is at one with the mountains, at peace with all things of nature. Trevor captures all of his rides using his GoPro, a helmet-mounted camera so he can relive these precious moments time after time. One particular Saturday however, Trevor’s camera captures something absolutely unexpected. Something eerily haunting and horrific - something that actually never happened. Yet. Is the footage captured on the camera an omen of things to come? Is Trevor reconciled to the fate foretold, or can he change his own life story? Wow. After reading this gripping tale, I was overcome with several different emotions, denial being first, as I refused to believe the story was over. Acceptance quickly kicked in when I realized that the ending was absolutely perfect, and it could not have been written more effectively. Thirst, (is that an emotion?) came next, as I fanatically searched the internet for more works from this author. Finally, satisfaction, when I realized that this is the best novelette I have ever read, period. The writing is nothing short of brilliant. Avery knows her way around words and uses them with expertise to captivate the audience. Descriptive, fine-tuned, crisply detailed, and polished, I had no trouble imagining every step of Trevor’s journey. I know it’s cliché, but I was on the edge of my seat with wanting to know what happens next, devouring every word. You might think you know how it is going to end, but Avery throws in a complete surprise at the very end. 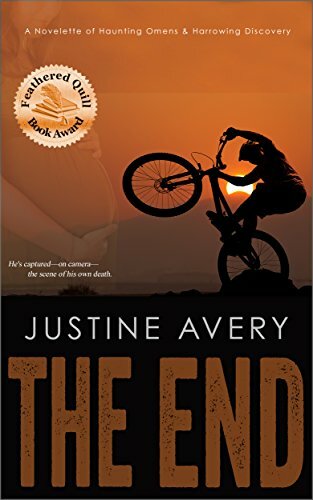 "The End: (a Novelette of Haunting Omens & Harrowing Discovery)" by Justine Avery is a must read for all fans of the suspense and thriller genres, but will be enjoyed by anyone that covets a well-told, well-written story. That said, I highly recommend this spellbinding tale – to everyone! It only takes a short time to read, but will stay with you much longer as you contemplate and reflect upon your own life. Fantastic story!